A traditional Dark Real Ale kit that produces 40 pints of easy drinking beer. 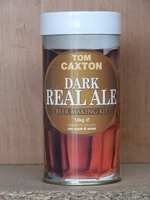 A long established and well regarded range of homebrew beer kits, the Tom Caxton beer kits all contain1.8kgs of wort, to allow you to brew quality beer at home. This Traditional Dark Real Ale home beer making kit produces 40 pints of easy drinking beer. The hop enhancement sachet can be used to adjust the final aroma and bitterness of the beer to suit your personal taste. Simply add water and 1kg of sugar. brewing sugar or beer enhancer. You can also use this kit to produce 36 pints of stronger, fuller flavoured ale by simply adjusting the amount of water you add to the wort.